Easily confused for deodorant, the Colltex Ski & Skin wax also helps to prevent stink. The wax consists of special paraffin waterproofs that prevent ice buildup on your skins. It can also be used on your ski bases. This means you glide faster and work less hard, possibly preventing body odor*. Turn the knob as you would with your primary Speed Stick and out pops beautifully smelling skin wax. 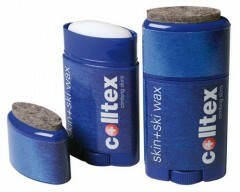 Rub onto your skins or skis and optionally rub more with the handy felt pad on the lid for a friction hot wax. Start skinning/skiing and enjoy the smells of the Swiss Alps. * This claim has not been evaluated by the FDA.